The word “Zigeuner” (“gypsy”) is derived from the Greek athinganoi, meaning “untouchable” and refers to the position of Roma within the Indian caste system. Already in the thirteenth century, this exonym was applied to “asocial elements” – for example, within the context of the first European “edict against the Gypsy plight”. For the Nazis, the term was synonymous with “unwertes Leben” (unworthy of life) and was widely circulated in Nazi mass propaganda. Even today, the word is still often used without thinking about it. 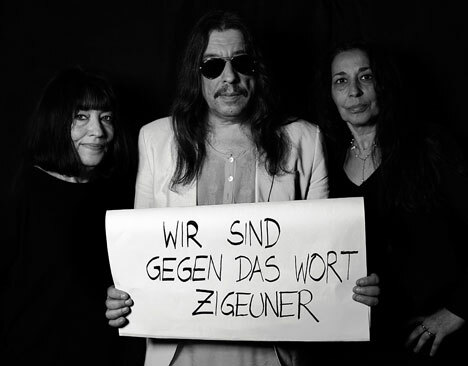 The campaign was initiated by people closely associated with the Gipsy Music Association, and demands that “Zigeuner” disappear from media reports, product names, and ultimately from everyday use all together. They also point out that the majority of the Roma community in Austria does not want to be called “Zigeuner” and demand that this wish finally be respected. The correct term is “Roma and Sinti”. It is true that some Roma do indeed call themselves “Zigeuner.” There are many reasons for this, the most important one being that the word “Zigeuner” means different things in different languages. Roma in Hungary and Romania proudly call themselves “Zigeuner”, while in Slovakia the same word means “thief”. However, even Roma are often unaware of its meaning and negative connotations. For this reason, the initiators stress the importance that the campaign target everyone: Roma as well as non-Roma. 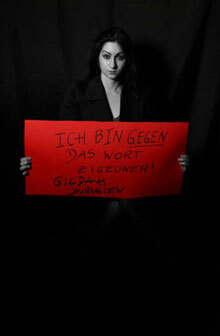 A central element of the campaign are photos of people from politics, media and other fields, holding up signs with the hand-written words: “Ich bin gegen das Wort ‘Zigeuner’.” Support for the campaign has been surprisingly broad: over 1,000 people have allowed their photos to be taken. These photos have been displayed in various exhibitions, a book and a video, in addition to their use in public relations and media co-operations. The campaign also includes workshops, for example in schools that aim to dismantle the prejudices around the values, culture and images of Roma. Roma and Sinti are the largest ethnic minority in Europe. There are between ten and twelve million Roma living in the EU member states. They have been forced to remain in migration by laws that forbid them to settle, by being marked as outlaws, by persecution and by being banned from certain trades. Today, around 95 per cent of Roma and Sinti are sedentary. Although the reality of the "traveling Roma" is largely long since a thing of the past, the idea -- along with a score of other, largely negative, stereotypes -- persist today.